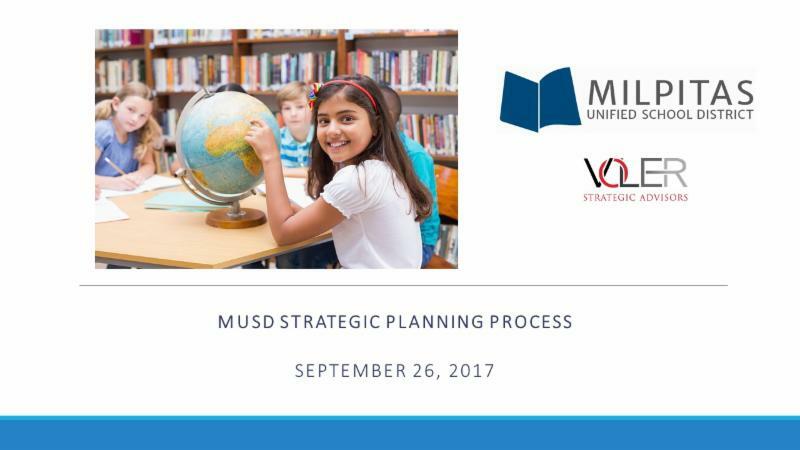 Fátima M. Rodríguez and Perla A. Rodriguez of Voler Strategic Advisors presented a summary report of stakeholders input for the development of Milpitas Unified School District's Strategic Plan during a Study Session. 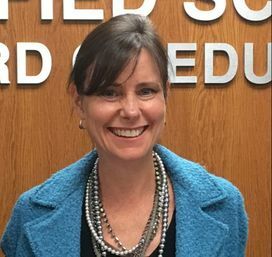 "As I have been thinking about this project, a Strategic Plan is so critical in terms of being able to align your resources and really develop long-term goals that accomplish the vision of the school district," Perla A. Rodriguez said. She explained that the Strategic Plan draft that was shared out that evening was developed from Local Control and Accountability Plan (LCAP) stakeholder input, interviews with several Board Members, four well-attended community meetings, and the District's August 7 visioning day event. "I was very impressed by the level of participation, engagement, and input that we got," Perla A. Rodriguez said. The representatives facilitated a conversation that will set the stage for the Board and staff to determine the three to five goal areas for a finalized Strategic Plan. Superintendent Cheryl Jordan explained that the Strategic Plan conversation will continue during the upcoming Board Retreat on Monday, October 2. With the input from the Study Session and that meeting, Jordan plans to draft a one- to two-page document and bring it to another Board Study Session to give the public opportunity for further input before the Board finalizes it in the future. In addition, Jordan said her evaluation goals will be tied directly to the Strategic Plan. The Board honored the following representatives from KLA-Tencor: Jijen Vazhaeparambil, Vice President and General Manager; Cindy Campbell, Executive Director of the KLA-Tencor Foundation; Baishali Sen, Human Resources Business Partner; and Joey Li, Product Marketing Manager. KLA has donated approximately 10 volunteers and $10,000 to Rose Elementary School to sponsor the start of “Science is Elementary” in three kindergarten classrooms this year. Rose Principal Nanci Pass in addition to families, students, and staff attended the meeting, to show their gratitude for the support. Following a ceremonial photo, Li thanked the many people involved in making the effort possible, including Principal Pass, Campbell, and Tzipor Ulman, Chief Executive Officer of Science is Elementary. "She has also been very supportive in terms of expanding Science is Elementary to Milpitas Unified," he explained of Ulman. "Before it was primarily Mountain View, Redwood City, and Santa Clara. 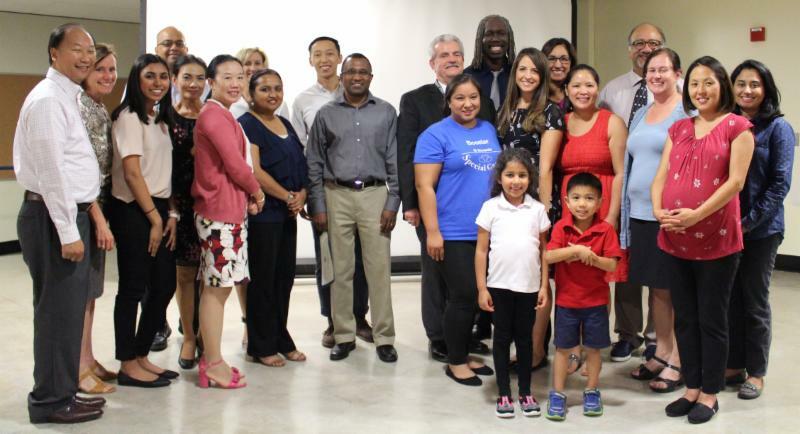 So this is our first school in Milpitas, and we're really proud of this." Li also shared a story about how he became involved with the program. He has been teaching as a volunteer in addition to his full-time job at KLA for about three to four years. "When I first started in Mountain View, I actually saw that volunteering makes a big impact," he reflected. "There was a student who was a really big trouble maker, in second grade, who wouldn't listen to anything. And he would actually answer all my questions intentionally incorrect to be a smarty pants. But when it came to this lesson on gravity and I asked him, 'An empty water bottle and a full water bottle; would it land on the ground at the same time or different times?' He was the only one that guessed it would drop on the ground at the same time." He emphasized: "So from that day forward, he actually paid attention to everything that we taught him. And I realize by sharing these stories, there are a lot of people who want to help but it's just connecting the right people with the right opportunity, and also finding an organization to be the foundation and platform to be able to help." Li concluded: "When you're able to see that these kids want to see you year after year, that's what really drives us. So I just wanted to say thank you and this is for everyone." For more information, read the Media Advisory . Superintendent Jordan welcomed attendees at Tuesday's meeting to Milpitas High School. 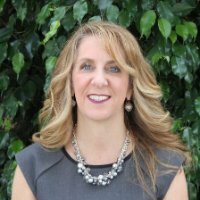 Periodically, throughout the year, the Board of Education will hold its meetings at different schools "in an effort to try and bring us closer to the community and in the hopes of having more people attend our meetings and also, more importantly, to let you know that we truly are trying to live a Culture of We," she said. Since the meeting was held at MHS, Jordan shared some highlights about the site. On Saturday, right outside the cafeteria doors (where the meeting was held), the District held its first ever all-alumni reunion, coordinated by Milpitas Mayor Rich Tran, Principal Francis Rojas, Board President Daniel Bobay, and Board Vice President Chris Norwood. Approximately 40 people showed up to the event, which gave Jordan the opportunity to speak with graduates from 1972, 1984, the 2000s, and during the recession. Jordan was also able to connect with a student who likes to claim her fame as being her first ever student, Jihan Ahmad. "What I thought was really interesting was talking to the group from '72," Jordan recalled.They shared that as freshmen, if the boys had hair that was touching the tops of their ears or the girls had shorts that were too short, they could be suspended. But within four short years, much had changed; long hair and mini skirts were the style, and the previous rules were out the window. "They really lived that Revolution time and I thought it was cool to be able to talk with them," Jordan said. Another highlight, she added, came from a carpenter and welder who graduated in the early 1990s. They spoke about their hopes to have more knowledge about career technology education when they graduated from high school more than 20 years ago. "They both said that they're having a difficult time recruiting employees because they need people who come out of school, not just prepared with a hammer, but how to use a computer," Jordan said. "So I thought, 'Wow. That really plays into what we've been talking about, which is building pathways to careers. ... So I think we're really on the right track of trying to find multiple ways for our kids to get to where they want to go so they realize their passions." Alyssa Lynch, Superintendent of Metropolitan Education District (MetroED), provided an update on their program, support of Milpitas students, and district-specific enrollment data for 2017-18. "For those of you that are not familiar with us, we have two schools that we oversee: Adult Ed, which is in the consortium that I know Milpitas is in, and Silicon Valley CTE (Career Technical Education), where we serve six school districts and have about 1,500 students. Together we have 3,200 students between Adult Ed and Silicon Valley CTE." She kicked off the presentation by sharing the 2017-18 district goals, upcoming events and activities, and new information about SVCTE. 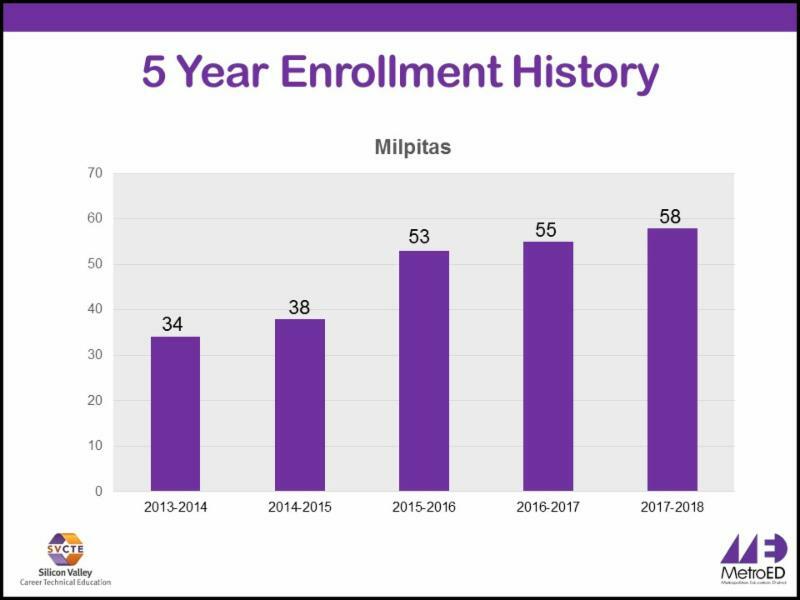 Later in the report, Lynch shared that 58 Milpitas students (53 from Milpitas High and five from Calaveras Hills High School) are attending their classes this year, further breaking it down by enrollment in each of the different classes. "I would direct your attention to 11 students in the Medical Science-Health Careers," she said, at the highest engagement, adding that Milpitas is filling up almost half a class in that alone. Course popularity is followed by nine students in Mobile App Design. Lynch then broke down MUSD enrollment over the last five years, sharing that it has increased from 34 in 2013-14 to 58 in the current year. This year, MetroED is also currently featured in a PBS Documentary: " Job Centered Learning." Four of their programs and seven students are in the film, being played nationwide 4,000 times, including three times in Silicon Valley. "So we are really pleased to be a part of talking about the value of career technical education nationwide," Lynch said. As a new part of the Executive Cabinet Report this year, Principals are taking turns providing a brief presentation to the Board about what's happening at their school. MHS Principal Francis Rojas kicked off the first report at the September 12 meeting. On Tuesday, Principal Damon James and Assistant Principal Luis Lopez shared out some of the work happening at Thomas Russell Middle School. James began by noting a couple of accomplishments. 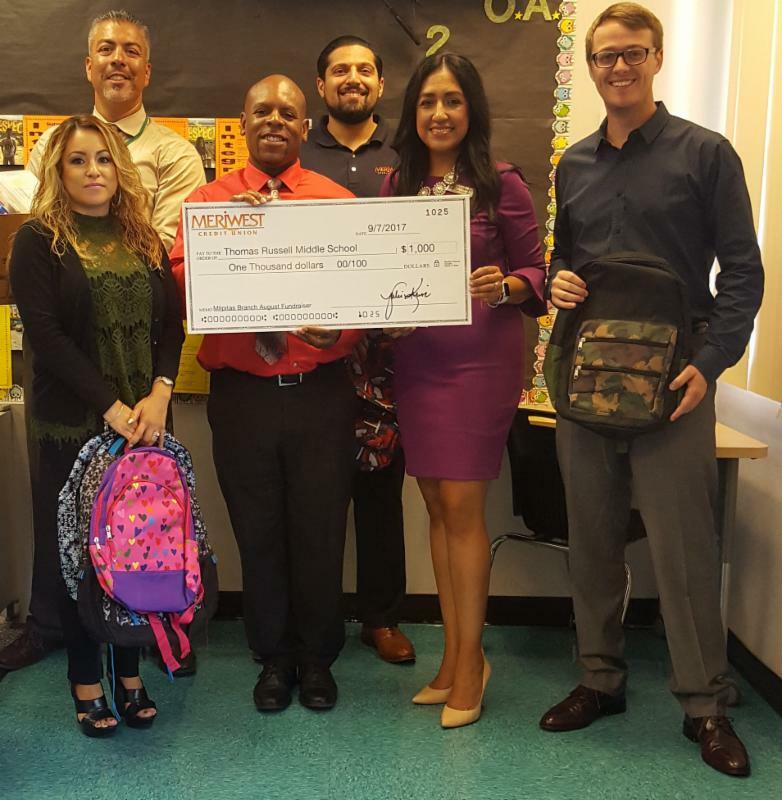 He celebrated Lopez' work with Meriwest Credit Union in receiving a $1,000 donation and more than $500 worth of school supplies, which included fully-stocked backpacks, to give out to some of their students. The school and Zanker Elementary were also recently recognized for having the highest attendance at their sites last year. James then talked about the school's focus to educate the whole child this year. Starting Monday, the school will kick off anti-bullying month with an assembly. The activities will continue with five spirit days, where students are being asked to dress as they would to support peace building. Themes include dressing in blue for peace, as a guardian angel, school colors for unity day, peace builder day where they're hoping students dress as all types of builders such as construction workers, and free dress. In addition, the final day, they are asking that no one eats alone. The following week, there will be a door-decorating contest with "no bully zones" for the different classrooms and the gym. Following, there will be a peace builder workshop, scheduled for parents, about cyberbullying and how to address the issue. An anti-bully task force will also put together training for students about how to handle bullying. The school is also focusing on prevention and self empowerment regarding drugs and alcohol. James said they have participated with the Department of Alcohol and Drug Services with the county as part of a grant. This enables Russell to receive a parent workshop, student workshops, and a "Walk in Our Shoes" program, which helps students learn how to understand and address mental health as a student. "We still have our intervention and our academic supports, but we really felt the need to focus on the whole child for this school year," James said.